Above: Fallen leaves cushion a hiker’s steps on the Pecos Wilderness trail leading to Stewart Lake. Photography by Laurence Parent. 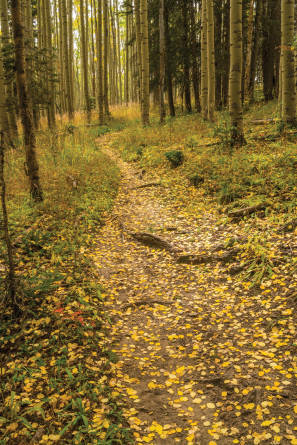 Beneath the thickets of white-trunked trees the horse trail is paved with ripened, rounded leaves that shine on the ground like freshly minted doubloons of old Spain, while from the boughs overhead others keep up a continual flutter that gives the species its picturesque name of quaking aspen. Backlit by the afternoon sun and topped by the sky’s warm azure, the translucent foliage kindles to a luminous magnificence that is indescribable. Then perhaps overnight the season changes. High among the peaks, a shower turns readily to snow flurry, and in the grey twilight, flakes come swirling, soft as the great owl’s feather, among the spruces. The brief summer is over, another winter has set in.